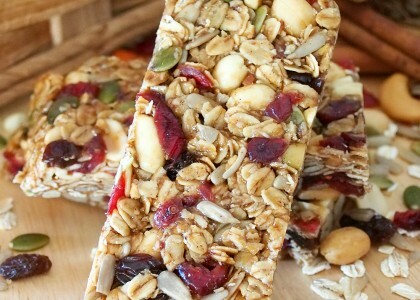 Once you make your own chewy granola bars, you'll never want store bought again! For this recipe, you will need one 9x13 pan, a saucepan, a cookie sheet, a mixing bowl, foil, and wax or parchment paper. Pour the oats onto a cookie sheet and sprinkle with a little cinnamon. Toast for 10-15 minutes, stirring every 2-3 minutes, until oats are a golden brown. While the oats are toasting, mix together the honey, brown sugar, peanut butter, butter, cinnamon, and salt in a saucepan. Melt over medium-low heat, stirring frequently. Bring to a boil and cook for 2-3 minutes, remove from heat. Pour toasted cinnamon oats, Eatnuts.com Cranberry Delight Trail Mix, and honey mixture into a mixing bowl and stir until very well combined. Prepare a 9x13 pan by covering with foil and spraying liberally with nonstick cooking spray. Pour granola mixture into the pan and press evenly. Coat hands with cold water to minimize sticking - make sure the granola mixture is packed down as tight as can be to ensure they hold their shape once cut. 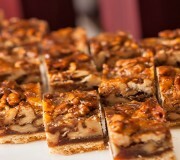 Top the granola with a sheet of wax or parchment paper, and place another heavy pan and books on top. Allow the granola to cool for at least five hours. Once cool, remove from the pan by lifting by the foil, cut with a sharp knife. The granola bars can be wrapped individually in wax paper - stored at room temperature for up to 1 week, refrigerated for up to 2 months, or stored in the freezer for 6-8 months. 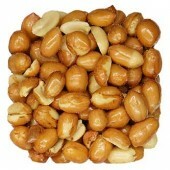 You can find our Eatnuts.com Cranberry Delight Trail Mix in 1 lb, 5 lb, and 25 lb options on our website! 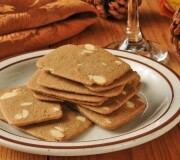 A rich almond flavor in a delicious cookie. 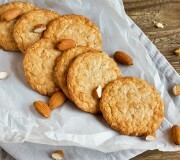 Crispy, not too sweet almond treats that are sure to please.